It was under the tightest of cloak and dagger secrecy that the heads buzzed and the mouths whispered. 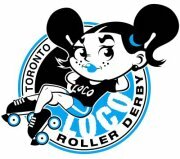 Then with blare and fanfare, Toronto LOCO came to light with the emergence of their facebook page Toronto LOCO Roller Derby. Then there was silence and it was with bated breath that we awaited the rest. Then in a flash, the rest of the story was delivered. 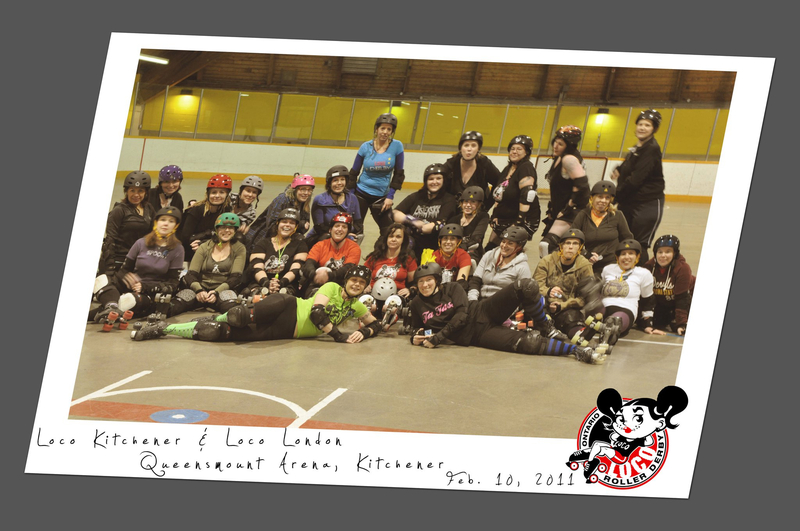 LOCO Roller Derby started in 2010 with about fifteen skaters in London, Ontario. Now there are six chapters across Ontario: London, Kitchener, Stratford, Brantford, and now Sarnia and Toronto! LOCO promotes low-contact roller derby which lets more women participate in the sport because it allows for diversity of athletic abilities, commitment levels and doesn’t cost as much to participate in. Sarnia and Toronto have just opened their doors and are already getting a great response. The Toronto chapter kicks off this Friday under the supervision of President Knuckle Slamwich, who originally started skating with London LOCO. 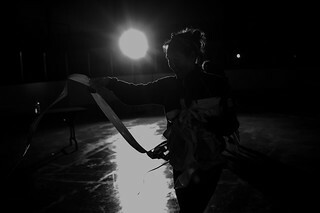 Practices will be held on Fridays from 7 – 9 pm at Emmanuel Howard Park Church (214 Wright Ave @ Roncesvalles). In Sarnia, LOCO chapter President Buffy Bodybag has also had a great turnout and promises to offer the flagship chapter in London some tough competition. “Vegas had better watch out,” says Buffy. Their practices are starting next week, but the excited skaters already have tee shirts printed and represented the league in Sarnia’s Labour Day Parade. They are also getting a ton of support from the media, including some from Ms. Bad Manners, a London LOCO skater and member of the Violet Femmes, who co-hosts the morning show on Sarnia’s K106.3. You can find out more about LOCO Sarnia at https://www.facebook.com/LocoSarnia and keep up with the Toronto chapter at https://www.facebook.com/torontoloco. Many cheers and good luck to all. Another set of great expectations awaits a certain someone. Preamble: This is another chapter from this year as we try to catch up in our Derby sojourns. This is just a brief lookback at the No Minors open scrimmage at Tri-City. Many thanks again as always to Tri-City, Hammer City, Belle City, Royal City, Forest City, and everyone. 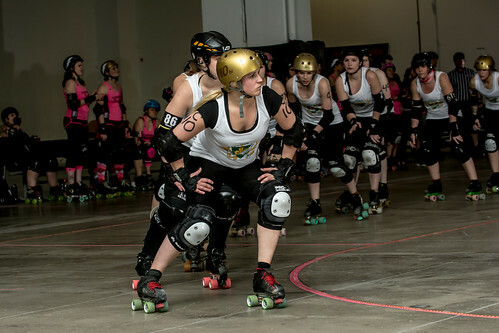 Sharks gotta swim or face extinction, so it goes with the evolution of Derby in its style of plays and rules. If you are not headed east for Beast of the East this coming weekend then another worthy LOCO Derby event is happening up in London on Sunday May 1. Yeppirs, WIPE OUT = their first live bout initially SOLD OUT. But additional tickets have just been made available. So act accordingly. 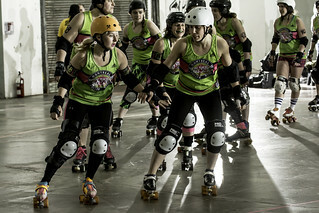 The roller derby part is in support of the Sexual Assault Centre London [SACL] and LOCO were chosen to help support the SACL in raising money for their cause. LOCO could be the way to go – whether it be where the chapters of LOCO are starting up in Tri-City and Forest City [ Kitchener and London ] – and maybe with an eye to the future to helping other cities who want to sprout a LOCO organization of their own or be shown how to start up. When I first heard about LOCO after meeting Pepper Assault up in Tri-City it sounded like a very exciting way to spread the sport. 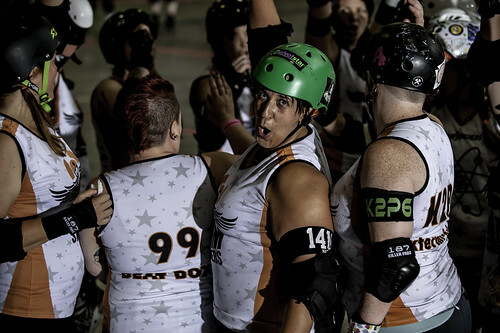 While Roller Derby Lite is a type of workout in Windy City or recreational Derby is practiced in Montreal as a form of Derby lite, or in local recreational leagues or skating associations around the GTA, LOCO has been more assertive in organization and recruiting. 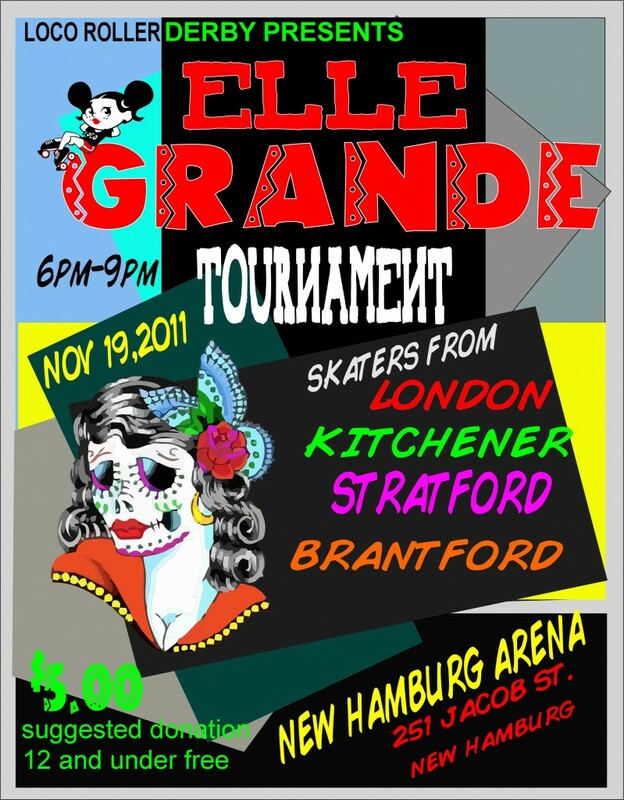 LOCO Roller Derby was founded in 2010 by Nia Capps and Vansterdamn in London, Ontario. 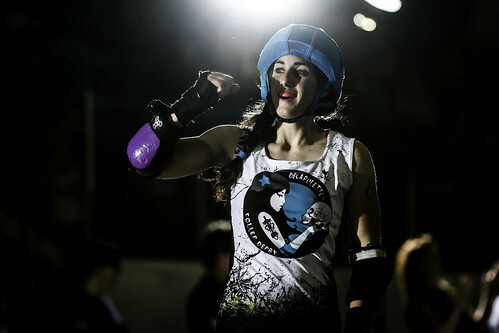 While the concept is called LOCO in London and Kitchener, back in 2006, Nia Capps was one of the original 14 with Montreal Roller Derby until 2008 with the team Les Contrabanditas. She then played with FCDG in 2009. Now situated in the Tri-City area, LOCO is Nia Capp’s way to keep her love of the sport alive. The intent of LOCO Roller Derby was to create recreational roller derby in Canada, to give women that for various reasons could not, cannot, or would not want to train for competitive WFTDA roller derby a place to learn, get fit, have fun, practice, and play roller derby in a low contact, all inclusive environment. 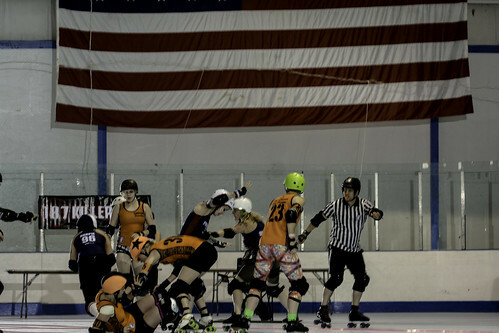 It is not a league created as any dramatic split from a local league, nor was it created to compete with WFTDA-style leagues. 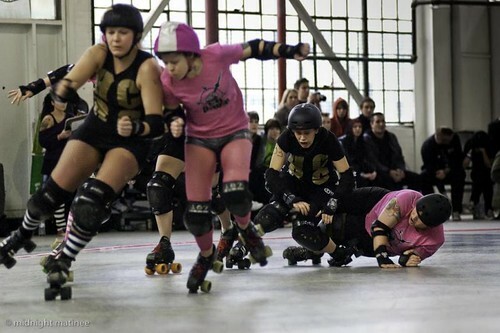 This is like your local city-run women’s hockey recreational sports league, only it’s for playing roller derby.